It seemed a fitting end to a year of amazing outings. A perfect book-end to wrap up this year’s events. 2011 started with the Wheeler Centre, and so too it finishes. One of my very first blog posts set out to describe my delight and awe at The Gala Night of Storytelling 2011: Voices from Elsewhere, at which I heard from the likes of John Birmingham, Mem Fox and Sonya Hartnett. This gala event set me on a path on which I have had the chance to listened to some most amazing story-tellers; Kate Grenville, Arnold Zable, Richard Flanagan, and Kaz Cooke, to name just a few. Last Friday was probably my last lit event for 2011 and it was with a brimful of gratitude that I attended the Wheeler Centre’s double billing featuring Tom Stoppard and Neil Gaiman. The opportunity to see two such literary luminaries had me quite a-gush, and the fact that Neil and his partner in crime, Amanda Palmer sat a row ahead of me did nothing to still my rapidly beating heart. In my 20s I spent a whole year reading plays. This was entirely as a result of having been introduced to the work of Tom Stoppard and it all started with Rosencrantz and Guildenstern are Dead. Once I’d read this, I moved on to his The Real Thing and Jumpers. I read Samuel Beckett, Arthur Miller, William Shakespeare and Tennessee Williams. I watched the film adaption of Rosencrantz…, starring Tim Roth and Gary Oldman, many times over, and it remains to this day, one of my favourites. I feel very privileged to have had the chance to hear Stoppard’s thoughts…his take on his ‘charmed life’, his attraction to language ‘for it’s own sake’ and the subtle, sometimes ‘clever’ art of playwriting. I’m also thrilled to have had the opportunity to say a very quick hello and thank-you to the man himself. 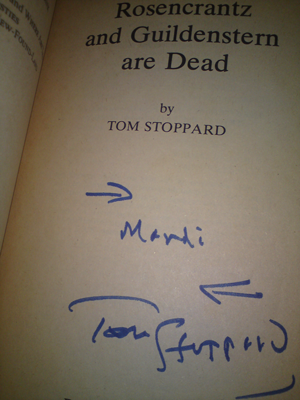 I felt a little bit of a fangirl lining up at the signing, but it was worth it for what has now become one of the most treasured parts of my book collection…a signed 1970s copy of Rosencrantz and Guildenstern are Dead. Priceless. After farewelling Tom, half the crowd left, half stayed, and new set of fanboys and girls arrived to hear from Neil. Waiting mostly patiently, somewhat noisily in the almost too warm lobby of the Athenaeum Theatre, the slight ripples of impatiences were stilled by a very special treat. Amanda Palmer, ninja-style. Amanda’s ‘lobby take-over’ on bar with ukulele had the crowd spellbound. All legs and fishnets and jet-lagged grins, the surprise performance went down a treat. On her last refrain the doors opened and on finding our seats we settled in for a night with Neil. What an icon, a mind full of life and ideas, dark humour and spirit. I don’t think I’d be alone in saying that I’d happily have listened to Gaiman chat all evening. With such a huge body of work, and a finger in pretty much every creative pie, he had more to say than we had time. He did, nonetheless have opportunity to share some of his thoughts on works like American Gods, The Sandman, and even Coraline. After the obligatory chat about his episode of Doctor Who and his take on the creative process, the night drew to a close. And so too did my literary calendar of events for 2011. But, never fear. Rest assured, I’ve plans. I’ve got my eye on a starter for 2012. How’s does the Wheeler Centre Gala 2012: Stories to Believe In sound? Don’t forget to enter this month’s give-away of a copy of Chris Allen’s Defenders of the Faith. Entries close tonight, you’ll find details here. Stay tuned too, for an extra special, Christmassy treat from TBYL. Details tomorrow! Prev A tough choice, but decision made! Next Your summer reading sorted, winner! It was a fantastic night, that’s for sure! Oh wow!! Thanks for sharing, that’s absolutely made my day! !